﻿Sprinkle 1 scoop, or 2 tablespoons, of ground flaxseed onto your cereal or oatmeal in the morning. Put 1 scoop, or 2 tablespoons, of ground flaxseed into your blender. Add the ingredients to make a smoothie. Then blend all together and drink! Sprinkle 1 scoop, or 2 tablespoons, of ground flaxseed onto your salad, your yogurt or your cottage cheese, or mix into your favourite juice. Mix ½ cup of ground flaxseed and your favourite seasonings to use as a coating for your chicken or fish. Then bake the chicken or fish as you would normally. Substitute ground flaxseed for oil in your recipe. Reduce the amount of oil in the recipe by 1 tablespoon. Then add 3 tablespoons of ground flaxseed. Your baking will brown faster so you need to shorten the baking time. Use ground flaxseed instead of bran, oatbran, or wheat germ in any recipe. You will use the same amount of ground flaxseed to equal whatever amount of bran, oatbran, or wheat germ the recipe says. 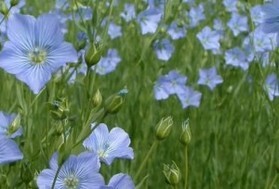 Freaking Fantastic Flax has a very mild taste. You can add the ground flaxseed to almost any recipe. It will not change the flavour of the recipe. It will only add nutrients. You can substitute flaxseed for hemp seed or chia seed in most recipes. Use as seasoning on just about any type of food. Use as a filler for your hamburger instead of bread or egg. Use as an egg substitute in any recipe. Mix 3 tablespoons of warm water with 1 tablespoon of ground flaxseed. Let the mixture sit for a few minutes, then stir. You will have a gel-like mixture that you can use for 1 egg in any recipe.